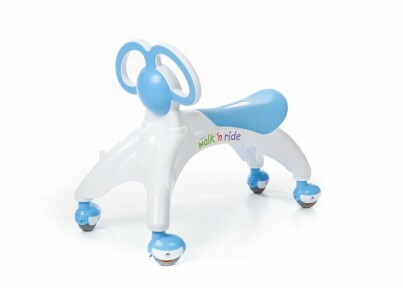 Didicar® Walk ‘n Ride is a unique Walking Trainer and Ride On toy for toddlers and children 12 months to 3 Years. Seat height 25cm. Overall dimensions 55cm L x 20cm W x 35cm H. Weighs 1.5Kg. The quirky cute design makes for engaging play. Unlike traditional baby walkers where you hang in a chair or ‘L’ shaped trolleys with fixed wheels the Didicar® Walk ‘n Ride allows your toddler to stand freely in front to toddle around. This independence at an early age stimulates space awareness and builds self confidence. The rubberised caster wheels allow for complete 360o freedom of movement whilst preventing slipping and marks on the floor. When you can walk and toddle the Didicar® Walk ‘n Ride becomes an amazingly addictive Ride On. The freewheeling design allows for some serious whizzing around providing good exercise while developing further spacial and speed awareness, balance and gross motor skills, oh and its great fun. The Didicar® Walk ‘n Ride can be used indoors or outside on any smooth flat surface. There are four funky colours to choose from, Green, Blue, Purple and Pink. Every Didicar® Walk ‘n Ride also comes with its own decorative customising sticker pack so you can personalise your ride. Once you have mastered your Didicar® Walk ‘n Ride you’ll be ready step up to your first Original didicar, Walk ‘n Ride’s bigger sibling, for children of all ages, and adults can ride too!